Fitness24seven case — PinMeTo | Your customers are everywhere - are you? How Fitness24Seven grew their organic daily reach on Facebook 35 times (3500%), using Facebook Location Pages for all of their fitness centers. Fitness24Seven is a Swedish founded fitness center chain with over 230 branches in Sweden, Norway, Finland and Poland. They currently have 166 fitness centers in Sweden and are expanding continuously. Like most other fitness brands they have a Facebook presence. When PinMeTo started to work with Fitness24Seven in the beginning of 2015 that presence consisted of one national brand page, just like many other chains today. What very few companies seem to have discovered is that there’s an enormous untapped potential for social activity that’s happening on each of the company’s locations: People are checking in, tagging photos, rating and writing reviews, and commenting. Of Fitness24Seven’s 166 fitness centers in Sweden, customers had been checking-in and bragging on Facebook about their gym activity 303,210 times as of March 3, 2015. That’s an amazing number of times the Fitness24Seven brand was shared by their customers - the best kind of marketing a company can ask for. The problem was that none of the 303,210 visits were actually made on Facebook pages under Fitness24Seven’s control. They were posted on fake user-generated pages completely unaffiliated with Fitness24Seven’s branding and missing basic information such as address, direction and contact details. It was basically 303,210 missed opportunities of brand - consumer interactivity. An example of such a page is below. For companies like yours, Facebook offers a brilliant product called Locations Pages. It’s essentially a Store Finder that’s built right into your Facebook brand page complete with a map and it connects all the local branches to the national brand page. What PinMeTo set out to do for Fitness24Seven was to ensure that all of their local fitness centers each had a proper Facebook page, with correct business information and branding. Once that was done, all unofficial (fake) pages was removed by merging the duplicate pages into the official local pages. Doing so moved the check-ins and likes from the fake pages to pages that Fitness24Seven owned. What PinMeTo found during the work with Fitness24Seven was nothing short of mind-blowing. As you might be aware, the organic reach (free daily views) of Facebook brand page are now virtually non-existent. If a company wants their content to reach anyone these days they have to pay. On Fitness24Seven’s national brand page, the total reach was essentially comprised entirely of paid reach. When they paid ad money, they reached more people, but as soon as they stopped paying, the reach went back to nothing. Fitness24Seven's Daily Facebook reach on their national brand page. When Fitness24Seven added local Facebook Pages for their gyms, something magical happened. The total reach of all the combined location pages just kept going through the roof. This reach came from all of the social activity created on the local gym’s pages: people checking in, posting photos and tagging the gyms - realising the potential of customers spreading the word. Fitness24Seven's Daily Reach With vs Without Location Pages. 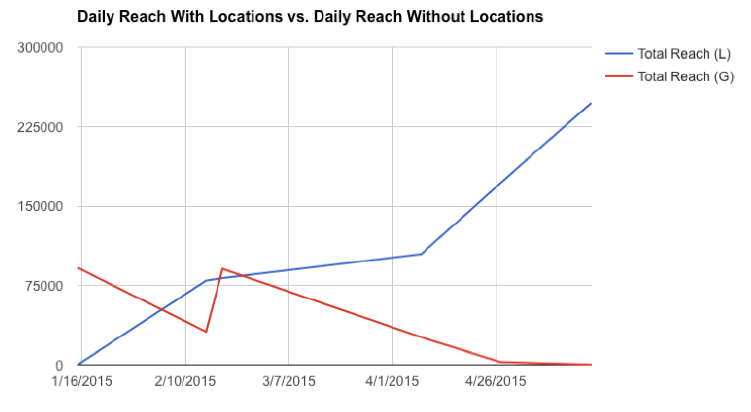 The daily reach on local pages completely outperforms the global page. By giving all of Fitness24Seven’s fitness centers a genuine Facebook Page and merging fake pages, they have grown their daily reach from 6,899 to 247,404 - organically! That’s a daily increase of 3486%, or 35 times. Over the course of only two months, that’s 10.5 million people who have seen properly branded, correctly listed, official Fitness24Seven content. The power is in local - recognising the quantifiable potential of working at a local level. People are acting locally, going to their local gym. That’s why it’s crucial for a chain to act locally online and in social media - where people are searching for places and sharing what they do. PinMeTo has built a product that makes it easy to do the work of setting up correctly branded Facebook Location Pages with up-to-date information, keep track of, and remove or merge unwanted user-generated unofficial duplicates.